Cookbooks from the Latin-American kitchen, like all international publications, are often very intimidating to the consumer. The path of least resistance is the “name chef” cookbook, and bookstores these days have a limited selection of authors. How can you tell if the recipes are genuine?—well, have no fear because I’m here to point you in the right direction if you want to discover the secrets of the mothers and grandmothers of Latin America, and also to turn you on to the best cookbooks written by our own local chefs. 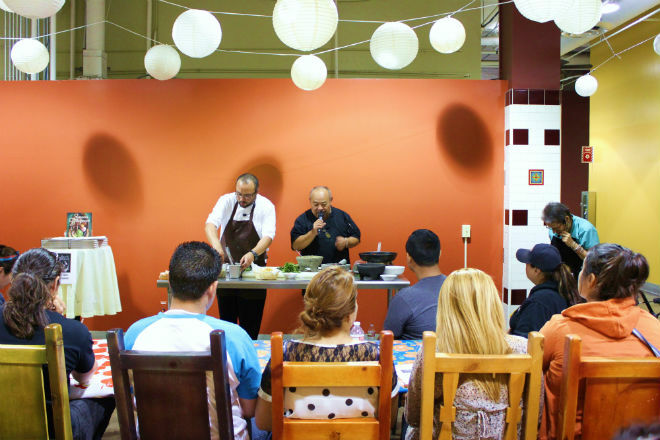 Sabores Yucatecos: A Culinary Tour of the Yucatan by chef Gilberto Cetina, Katherine A. Diaz, and Gilberto Cetina Jr. The most convenient aspect of this cookbook written by the gentlemen behind Chichén Itzá restaurant is that you can come taste his dishes before you make them at home. The book has over 140 recipes from the tri-state cuisine of the Yucatan: Quintana Roo, Yucatan and Campeche, which are edited and tweaked through calls to relatives back home. You can learn to make Yucatan classics like pulpo en su tinta (octopus in its own ink), huevos motuleños—a fun egg dish on tortillas that adds a sweet taste of the Caribbean with plantains, then a savory layering of black beans, ham, cheese, peas, and salsa—and a fiery pre-Hispanic pumpkin seed salsa called sikil pak that’ll be the star of any pot luck. If you’re still not getting the recipe right, Cetina and Cetina Jr. are easy to find at the Mercado La Paloma complex. Sabores Yucatecos: A Culinary Tour of the Yucatan is available at Chichén Itzá restaurant and online. Next articleCould This Safety Feature Have Saved Paul Walker?